Thea's Thinkings: Very Inspiring blogger award! I've been a busy bee but a few weeks ago the lovely Lauren from laurenslittleblogs nominated me for the Very Inspiring Bloggers Award! A big part of my blog this year has been giving advice and tips on self-development and improving self-esteem so it means a whole bunch to have been chosen for this award. Big big thank you to Lauren! Lauren's blog is lovely too with a bit of everything from beauty to lifestyle and baking so be sure to give her some love. 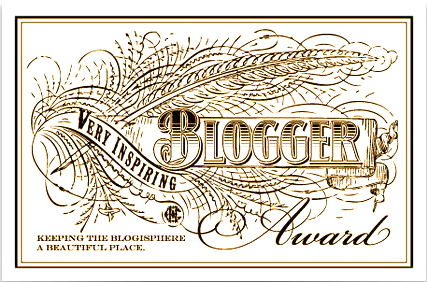 If you haven't heard of the very inspiring blogger award it's pretty much what it says on the tin. It's basically a way of showing other bloggers appreciation for the inspiration, thoughts, ideas and enjoyable nuggets of knowledge they share with the world. So without further ado I'm going to jump straight into the award with the rules for you. Short and sweet...so now for the fun bit. 1. Kristen Stewart is my secret (not so secret anymore!) girl crush. I really respect her values, her commitment to her profession and every film I see I'm more and more impressed by her talents as an actress. 2. I'm obsessed with old school point and click games. As much as I try to keep a girly exterior I love computer games and could not get enough of Terry Pratchets Discworld when I was a kid. 3. When I was in uni I had a baby kitten called Sox (she was all black with little white socks), she was my fluffy little world - 100% a cat person. 4. I'm a lover of languages, I can speak Welsh and French, Sign Language and some Japanese if I rack my brain but at the moment I'm teaching myself Spanish and loving it. 5. I had my appendix out when I was 7. I remember my teacher didn't believe I felt sick so I stayed in school the whole day, walked (trudged) home at which point my mum looked at me and in a heart beat said "it's her appendix" rushed me up to hospital, and a few days later my teacher brought me chocolates in the middle of lunch and I scoffed the whole lot down in between bites of jacket potato. 6. I'm a sailor. My Dad has a boat and we've been out on the waves since I was a wee girl but while I was away in University I almost never got the chance to go on a boat so challenge 2014 is to get sailing again (started last week hurray). 7. When I was about 4 or 5 I remember seeing my mum brush her hair in the bathroom and I told her "when I grow up I want to have hair as long as yours" and to this day I've never cut my hair short. I hope I don't get in trouble :p for this but I thought I'd change this. Instead of choosing bloggers I know and nominating them I want to give you the chance to do this too. It's always fun to share so if you're a blogger or have always wanted to start a blog and you'd like to do the Very Inspiring blogger award congratulations - it's yours! Feel free to name me as your nominator and be sure to let me know if you do it so I can come on over for a read. Thanks again to Lauren for nominating me! Tell me a random fact about you in the comments below!